2013 is the year when Casio’s flagship and highly popular G-Shock line of watches turn 30. Three decades is a long time. To consistently stay on top of the game for such a long period of time is truly a non-easy feat. That is why Casio has decided to hold a year-long 30th anniversary celebration that kicked off in September 2012. Among the few limited anniversary edition announced during the initial kick off was G-Shock GF8230A-4. But just what makes this model so special? First of all, to begin with, inspiration of this commemorative G-Shock GF8230A-4 model is inspired by G-Shock Master of G series. To be exact, it is a specially enhanced variation of the FROGMAN GF8250-2 model, one of G-Shock’s toughest watches and most popular model. One notable difference is the color tone of the GF8230A-4 which is entirely different from the earth tone colors that were made available for GF8250-2 model. GF8230A-4 comes in bold and striking combination of red and black. This is the signature color for all Casio’s G-Shock 30th Anniversary limited edition watches. Since only limited quanity of this model to be produced, this commemorative model has dual appeals. First, it has the functionality appeal that makes the FROGMAN GF8230A-4 so well-loved. Second, it is seen as highly valuable from collectors’ perspective, just like all the rest of the G-Shock limited edition series. 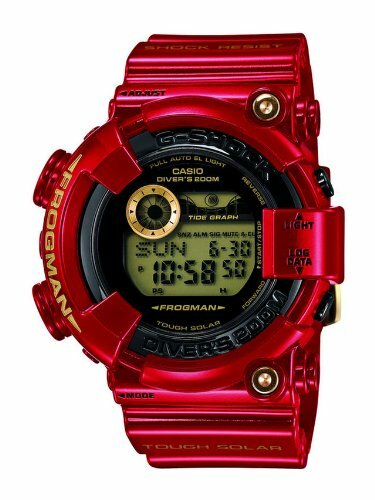 Designed by one of the world’s renowned graffiti artist Eric Haze, the gloss red digital watch with gold mirror face projects strong and bold characters of those wearing it. Own a piece of G-Shock history with GF8230A-4 timepiece. Next, onto the features of GF8230A-4. Being part of the G-Shock Frogman line-up, this watch is designed to be an amphibious tough watch. In laymen terms, this simply means a device that is designed to be operated and survived both on land and on water. So, if you are into water sports or spend significant amount of time in contact with the water, then you know what you’re looking at. The GF8230A-4 has a dive timer which you would definitely find useful on your diving trip. Be it for leisure or professional diving. It is designed to withstand atmospheric pressure of up to 200M below the water surface. By any means, there are not many watches out there that can offer you this kind of depth. On average, you would get in the range of 30-50M, unless you are talking about watches designed for professional diver. Don’t just take my word for it. Take a look at the video below to see the kind of testing that is being carried on each of the G-Shock watch for them to attain the ISO 200M label. Let me know if you can find other watch brands that undergo such burgeoning test processs. I bet there will not be many. To assist you in determining the weather information before you set out for the sea, GF8230A-4 comes with tide and moon graphs. This will let you know when the tide is low and it is high. So the next time before heading down the water, you can better prepare and equip yourself by simply turning to your wrist and glance at the information being displayed on your watch. Another remarkable feature of this watch is its Solar Powered rechargeable battery. This is probably the next best alternative to the convenience we enjoy in automatic watches. Being rechargeable means that (theoretically) we no longer need to head down to the store or open up the watch to replace its battery with a new one. But take note that battery being an electronic device, no one can provide the guarantee that the battery will last forever. The lifespan of solar powered rechargeable batter is of course dependant on many factors and how well you maintain them. Just like any other rechargeable battery technology, expect defects and leakage over time. One advice that I always followed in taking care of my solar-powered G-Shock watches is to wear them on regular basis, just to make sure that you charge up the battery periodically, before the battery runs out completely. If you live in tropical climate where you get to see sunshine all year long, this would not be a serious problem. However, if you live in non-tropical climate where you do not have sunshine luxury all year round, you need to pay particular attention. For now, I’ll leave you with the technical specification of the G-Shock GF8230A-4.